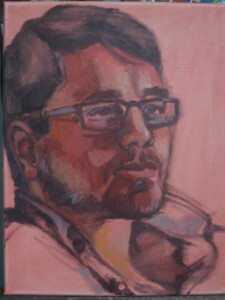 A portrait of Sam by S. Kennedy Irwin. Sam Kendall will be the featured poet at this month’s Sourwood Reading Series (Thursday night from 7-8 at The Newsstand on Main St.) so we thought we would take some time to let you get to know him before Thursday. FriArts: How long have you been writing poetry? Sam Kendall: Something like, but not necessarily, a decade. FA: Who is your favorite poet? Or who are you currently reading and why? SK: My favorite poet is Li-Young Lee; I don’t think you can touch him in terms of gentleness and intentionality, and he deals very well with the subject of spooning. Have you ever eaten something delicious but not wanted to know what was in it for fear the details would gross you out? That’s how I feel reading Lee’s poems. I’m currently reading Ocean Vuong’s debut collection and ‘The Dream of a Common Language’ by Adrienne Rich. FA: What poem are you currently working on? What is it about? FA: What is your favorite poet’s favorite color and why? SK: It’s probably either green, orange, or violet. I’ve never met him, but it seems to me that the secondary colors are the baby bear’s porridge of colors, appealing to those both unsatisfied with primary colors and overwhelmed by the multitude of tertiary colors. LYL seems like a baby bear’s porridge kind of guy. We can’t wait to hear more from Sam this Thursday. Come join us!